There are 41 2BHK, 3BHK, and 4BHK multistorey apartments for sale in Somalwada, Nagpur in the range of Rs 24 lakhs to 90 lakhs (average rate Rs 4,110/sq ft.). You can also look for apartments & flats in locations nearby Somalwada, like Manish Nagar, Manish Layout and Ujwal Nagar. 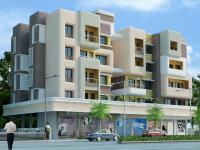 4 BHK Residential flat at a very strategic location.